The Carnmoney Football Development Centre Under 14 side suffered a defeat at the hands of Linfield in their National League Under 14 A tie on Saturday. In freezing conditions, the home side got off to an electrifying start, going 3-0 up in the opening 20 minutes. The opener came from a curled shot from Aaron McNeice, who was having a superb game in midfield, as he placed the ball in the top corner, out of the outstretched keeper’s reach. This was quickly followed by a neatly placed header from Scott Wilson, who had recently returned to the Newtownabbey side. The third came from a weaving solo run down the left flank from Wilson, who stroked the ball into the bottom corner. Table-topping Linfield managed to pull a goal back, to make the score 3-1 going into the break. The weather played a big part in the second half, with Linfield coping better in the strong wind and snow showers. Just like the last meeting between the two teams, the Blues found a new gear and were back on level terms at 3-3 within 15 minutes of the re-start. The CFDC boys went down to 10 men after a double yellow card and the South Belfast side were able to make their numerical advantage pay off. 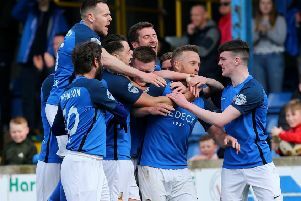 Linfield showed why they are sitting top of the table, scoring another three goals to make the final score 6-3 to the away side. Next up for the Carnmoney side is a tie against Cairny Youth at Ulster University, Jordanstown. This game will kick off at noon on Saturday, February 6. Team: Ben Nicholl, Ethan Hall, Matthew Graham, Max MacCauley-Brown, Euan Ashcroft, Jack Rainey, Aaron McNeice, Justin Grattan, Donal Cullen, Nathan Swain , Lewis Barr, Craig Elliott, Luke Matchett and Scott Wilson.